There are some nights I lie awake wondering how I got here. Not how I physically got into bed (I’m a few years away from that) but how I became a father, a teacher, a writer. I watch the ceiling fan spin, listen to my wife snore and try to comprehend the facts of my life. I think (and hope) this normal for most people pushing 40 years old. It is in these late hours where stories prove their worth, where stories provide necessary reassurance and perspective. Maybe that’s why as children we desired to fall asleep to the comforting rhythms of a story. Our lives are just a collection of stories strung together like laundry on a line. Some stories are better than others. Some stories are fancy and meant to impress. Some are new– bright and vibrant. Some are faded and worn. Others were passed down–second hand stories that we adopted as our own. Some stories never get old and fit just right. If you want to learn what’s under a person, listen to their stories. Are they the constant victim? The proud hero? The humble hero? A foolish drunk? The lovable loser? Listen to their inflections. Watch their subtle expressions. We define ourselves by the stories we tell. Or in some cases, fail to tell. The first story I wrote for this website was a story entitled The Wink. A story about a baseball game I played in 20 years ago. In the many years following that game, I realized that the game, the story, became a symbol of the relationship I have with my father. Furthermore the wink, the gesture, also fashioned into a symbol now etched in my own mythology. It wasn’t until I was alone, laying nervous and scared in the confines of a CAT Scan tube that I fully understood the significance of that story, of that wink. Chase and I at the Phillies game. 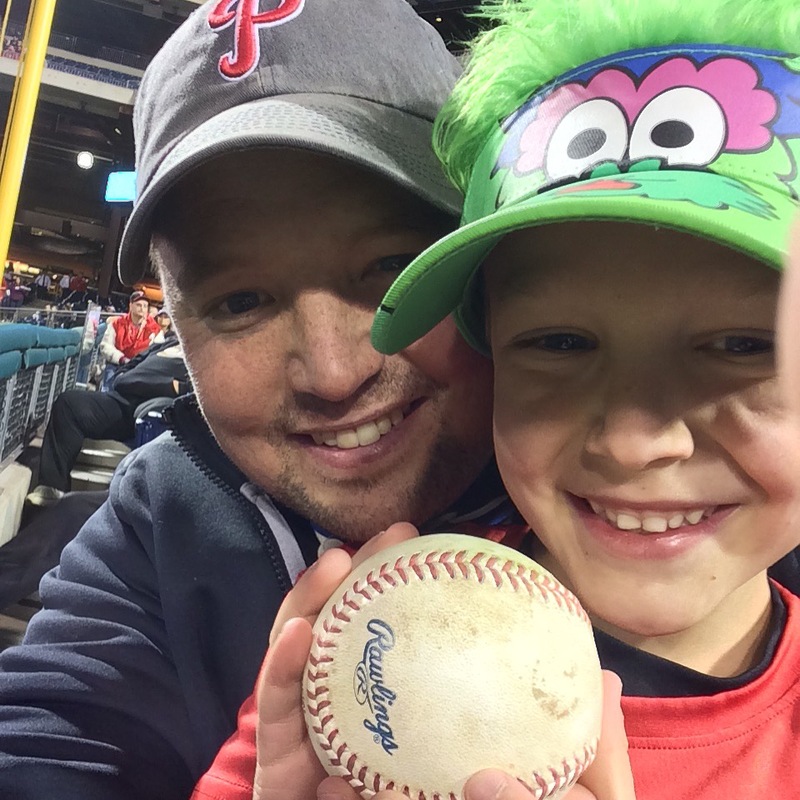 A game in which Chase got his first foul ball. As a parent, it’s a delight to witness your children begin to collect their own stories. Stories that will one day symbolize something bigger. Years from now when Chase runs his fingers across the seams of that ball, I hope he will be magically transported back to night of April 30, 2016. I hope he will still smell the popcorn we shared. Feel the soft wind on his face. Hear the crack of the bat. I hope he recalls this night with fondness, the way I will. And years from now, when he finds himself at a crossroads–the intersection of present and future– he will think of this night, of this story and realize that the past can provide the reassurance needed in that moment. I hope that ball and the story it holds will calm him, rock him and remind him of the love we share.